With 135W Output Power, F&D F6000X system comes with 3-inch drivers for satellites and 8-inch bass driver for sub-woofer. 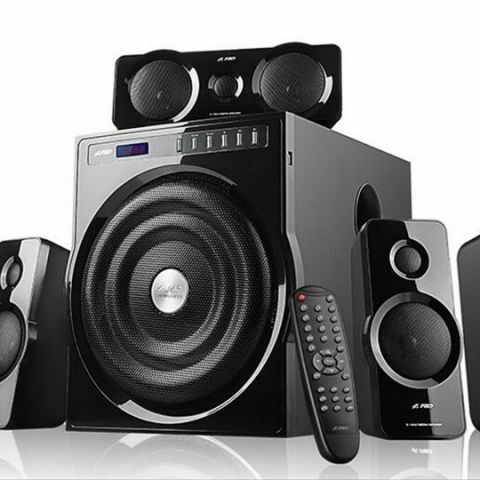 F&D has launched its true Cinematic Surround Sound speakers ‘F6000X’ for a price of Rs 14,990. The speaker system is already available at leading stores in India and delivers 135W Output Power with 3-inch full range drivers for satellites and 8-inch bass driver for sub-woofer. There is a metal grill design for both satellite and sub-woofer along with a high glossy plastic satellite. F&D one of the leading & oldest Audio Brand, rolled out a must have Audio experience ‘5.1 surround sound speaker system – F6000X’, which promises to offer stellar, best-in-class sound quality that no other speakers can match at the budgeted price. Whether for the living room or bedroom, for music or movies, the speakers have the sound quality your system deserves. Sporting the stylish design & exquisite looks F6000X lets you experience the magic with Automatic Multicolor LED on subwoofer that shall treat you with not only amazing sound effects but visual effects too. With 135W Output Power, crank up the sound, with powerfully clear, crisp and balanced acoustics. The system comes powered with 3”-inch full range drivers for satellites and 8”-inch bass driver for sub-woofer. It comprises a heavy-duty metal grill design for both satellite and sub-woofer along with a high glossy plastic satellite, to suit the interiors. Stream music wirelessly with Bluetooth operation range that works upto 15m or simply plug and play from any Media device you want – USB/SD Card, TV, DVD/MP3 Player, PC or any of your multimedia stuff. The all in one companion also comes with FM radio upto 100 stations, that can be controlled directly with numeric keys on the remote. Ensuring user friendliness and ease, F6000X enables controls from the Smartphone, Download the app “Fenda” on Google Play store to take control of your listening experience. I am luking for 2.1 surround speakers of upto rs 5k. Kindly suggest. For music n tv.